The origins of this feast lie either when the capital of Byzantine Christianity, Constantinople, was under attack by either the Avars and their Slav allies or the Rus’, a Slavic nation and ancestor of modern Ukraine and Russia. Our Lady appears in the dome of the Blachernae Church to extend her veil over the praying people, and the attackers left. Andrew was a Scythian – from the people who once inhabited southern Ukraine – or perhaps a Slav, but either way he had been captured in a raid and enslaved as a little boy. Though he had a good education courtesy of his master, he took on himself the very difficult charism of a fool for Christ ‘s sake. In this, a person fakes madness and wild behavior and when treated cruelly by others, accepts that in atonement for the suffering of Jesus in His Passion. But these fools were always people with deep spiritual insight and often the gift of prophecy, which he revealed to his confessor at Hagia Sophia and to his disciple, Epiphanius. The miracle happens in the Blachernae Church, where the robes said to be those of Our Lady were kept. The emperor, imperial family, and citizens are packed into the church during a service to Mary, imploring her intercession to save the city. But only Andrew and Epiphanius see Mary enter the dome, attended by angels, John the Baptist, and saints. She extends her veil out over the people and bows her head in prayer to God, then they all depart, and the crisis ends with the withdrawal of the enemy. What does this feast teach? To whom is the glory of heaven revealed? Not to the rulers of the church or the state, but to two men who accepted rebukes and mocking for the sake of Christ’s Passion. No matter what my position is, I am only worthy of God when I am humble like Jesus in the manger of straw kept warm by the breath of the ox and the donkey, worshipped by the shepherds and foreigners who were rejected by the Jewish law, and when I seek to atone for the sins of mankind by loving our Jesus more. The vision would leave us awestruck – the mysteries of God are all around us – the glory and beauty of nature, the wonder of science. We not only walk around in ignorance of that most of the day, but even more so ,we forget the beauty of God far too often. We are both natural and spiritual, science and faith. An appearance like this one is tremendous – but so too is the hidden appearance of Jesus under the form of bread, and so too is the whispering of our angel’s wings as it guards us, and the assembling of angels around every altar at every Eucharist when the people sing Holy, Holy, Holy, Lord God of hosts. Where is the body of Jesus? Where is the body of Mary? In a Church that was so consumed with the desire to have relics of the saints, never did anyone claim to have a piece of bone of these two. They have been raised from the dead and are united body and soul, both the Son of God and the woman from Nazareth from which nothing good came. Science and Faith are united in a unique way in those two, and the appearances of Mary, at this event a thousand years ago and at so many others, is a sign to us of our destiny, and the hope of all the faithful, and they live in the home to which so many millions of souls have already gone to. This is a place that telescopes will never reach to, a place so beyond us but also of us, since we are born knowing that there is something beyond us, beyond our world, our existence, that the human soul reaches for. Even atheists do this, when the communists proclaim that Lenin Lives, Mao Lives, Socialism Forever – there must be something beyond “here”. And in this feast, the two worlds collide – but in the gentlest of ways. Two men are able to see the glory of heaven open up in a church dome and then they spend the rest of their lives fervently praying that they will achieve it. So too for us who took out the time to come tonight – to celebrate the living intercession of Mary, the beauty of our destiny in this church that humbly tries to reflect that glorious place. For us in the eparchy of Phoenix, it is our patronal feast day. 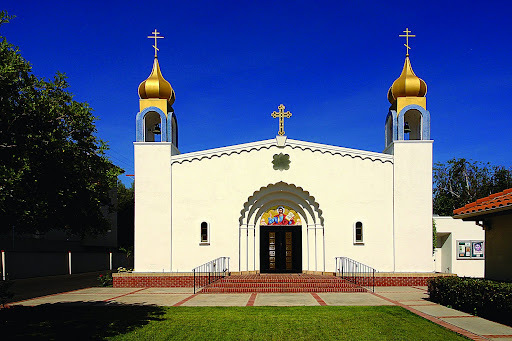 The first Byzantine Catholic church built on the West Coast is Saint Mary of the Holy Protection, now in Sherman Oaks, California. Father Eugene Chromoga started with one family back in 1957 and his boldness under Mary’s protection has created an entire eparchy from Alaska to Albuquerque. The very name of this eparchy proclaims the belief of Catholics and Orthodox that God has granted that the Virgin Mary can come before Him and intercede for those on earth. Jesus is the King of Kings, and in ancient Israel, the mother of the king, known as the Queen Mother, was always asked to present petitions to her son. She was the Advisor and Confidant of the King, and they were so important, that in a male-dominated culture, the names of the queen-mothers are preserved in the books of Kings in the bible. Our Lady is the favored one of God, the angel Gabriel says, and in the Magnificat we read “all generations will call me blessed” and we proclaim her blessed as we recount the generations of Christians who have asked the protection and intercession of Our Lady. May our parish dedicated to her icon of Perpetual Help flourish, may our Bishop Gerald along with the priests, deacons, and Religious of our eparchy named for her Holy Protection be strengthened in their labors, and may the Catholic Faith be strengthened through through the work of all of Christ’s missionaries who call on her assistance.